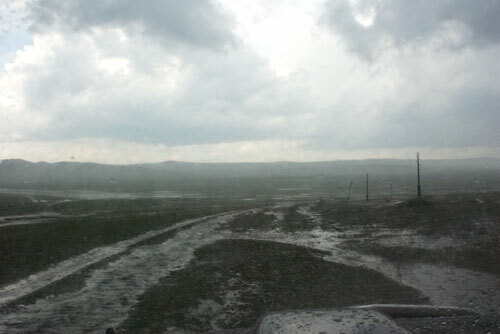 Mongolia gets very little rain and most of what does fall comes in the summer. After the brutal winter zud (a drought year followed by an extremely cold winter with heavy snowfall) that hammered the country these past months, a year of good rainfall would be a blessing, indeed. Being a herding culture, the Mongols have always depended on rain to grow the grass they need for their animals. 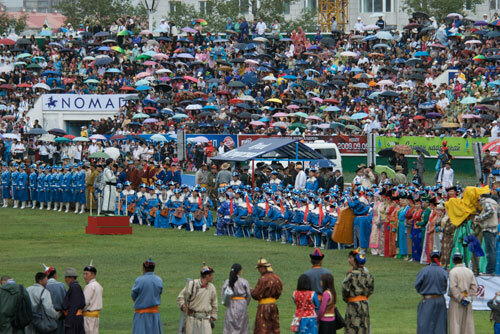 The rainy season is short, so I suspect that as wonderful as a Mongolian summer is, it’s also a time for some anxiety. In 2008, rain came late, at the end of August. My husband and I were at Ikh Nartiin Chuluu Nature Reserve. We arrived on a beautiful evening. 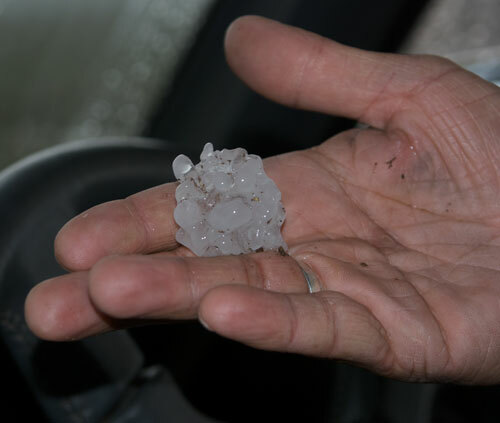 It started to rain at around 3am and didn’t stop for 18 hours (we counted). But we had perfect weather for the rest of the trip. In 2009, on my Artists for Conservation Flag Expedition, it was definitely the rainy season, even though there wasn’t enough to break the drought. 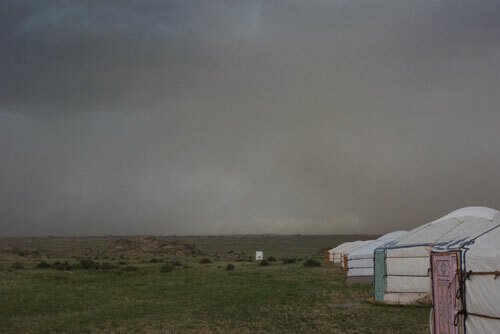 On-coming rainstorm at Ikh Nartiin Chuluu Nature Reserve, July 2009; it rained hard for an hour and a half so I just stayed in the cozy ger; the white rectangle in the background is one of the toilet enclosures. Yes, it was a bit of a walk. Rain has, so to speak, seeped into the culture to the point where it’s a leitmotif in many of the music videos I’ve watched and clearly has romantic connotations. Sometimes it seems like there has been an informal competition between groups and singers to see who can work the most rain into their video. Here is one from Javhlan. Imagine this singer with an absolutely glorious voice, standing in the woods singing as the crew poured “rain” onto him. I’ll bet he only needed one take. And, taking it even further, is A Capella’s “Boroo”. Hope it was a warm evening. Finally, instead of a set-piece like the previous two, Guys 666, who normally seem to be hard rappers, did this video, also called “Boroo”, that tells a story, albeit not an entirely happy one. I’m an American who lives in northern California. I just came back from my fifth trip to Mongolia, which has become a second home to me. I have put a lot of effort into learning about your country and its history and I’m pleased to read your comment!